The sign on the window made me sad. Not because of what it said, but that it had to be said at all. And additionally because our federal government felt the need to create a law about it. Oh, they got the sentiment right, but it is a sad commentary if, as a society, we are so broken about doing the right thing that the minutest details of our life have to be codified by the government. CS Lewis was one of the most brilliant authors of the 20th century. While raised in the church early in his life, he threw off the restraints of “religion” at a fairly young age. His path led to an atheistic worldview for a while and then moderated to more of an agnostic perspective over time. In his classic book, Mere Christianity, he identifies the existence of a moral code within every society as the reality that caused him to rethink his worldview. The moral code – that framework of right and wrong, was intrinsic to every society. Yes there were differences from place to place, but virtues such as loyalty, courage, and honesty within the tribe were consistent across every group. Likewise the vices – betrayal, cowardice, lying within the tribe, were common threads across people groups. The only logical explanation was that a universal law existed. And if such a law existed, that demanded a Creator of that Law. Hence Lewis followed the logic and expanded his godless worldview to include the reality that God existed. Being the brilliant mind that he was, Lewis’ curiosity could not long rest with a riddle partially solved. But neither was he going to be taken in by mere sentimentality or man-made religious dogma. He was convinced that God existed, and therefore, the potential existed that He could be found. His position on the staff at Oxford University gave him unfettered access to vast amounts of information collected from around the world and from history’s earliest recorded times. Lewis was uniquely prepared and uniquely positioned to ferret out the truth. I find it fascinating that JRR Tolkien was a fellow professor and confidant of Lewis. In my mind’s eye I picture these two literary giants cloistered in the hallowed confines of Oxford, sharing a drink at their favorite pub, pondering the meaning of life, the potential existence of God, and how their latest book was shaping up. His search led him back to Jesus. Which brings me back to the writing on the window. Right and wrong do exist. And while I agree with Lewis that God is the authority of what is right and wrong, many people today resist or outright reject the reality of a Supreme Authority. That vacuum is untenable. Chaos, anarchy, and strife fill the void. Society was not meant to exist without the structure that a framework of right and wrong provides. So into that void government – whether it be a dictatorship in a third world country, elected leadership in a democracy, or simply the village chieftain, rises to define and enforce the law. The problem with laws is the tendency latent in every person to break laws we don’t like or aren’t convenient for us. In many cases we actually like the laws… so long as they apply to everyone else and I can be the exception when necessary. The apostle Paul talks about this a lot. The Law, in his writings meaning the Law given by God to the nation of Israel through Moses, served God’s ultimate purpose of pointing to our need of a savior and redeemer. Jesus, was the only person who has ever lived who perfectly fulfilled the Law. He was without sin. And as such by His sacrificial death on the cross He was able to pay the price for every lawbreaker who has ever lived. Those who accept His death on their behalf can receive forgiveness and reconciliation with God. 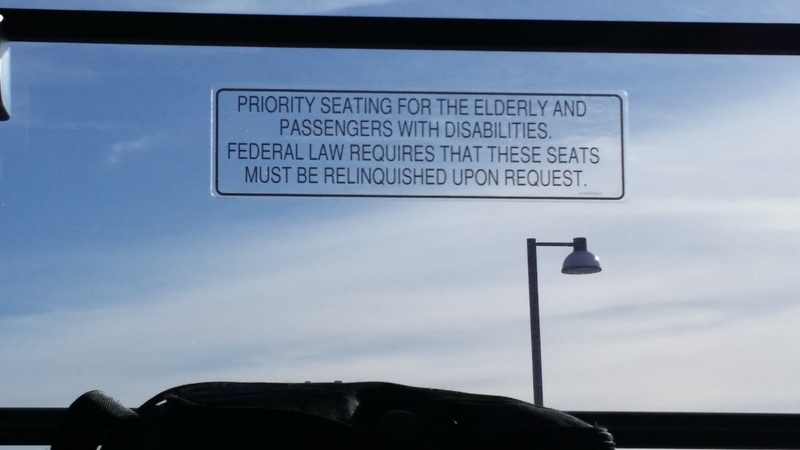 In place of obeying the writing upon the window out of duty, we will look for someone needy of our seat and we will leap at the chance to provide it. For the widow and orphan, we will reach out in love to provide for them. For the sad and discouraged, we will speak words of life and hope. We will act with compassion and kindness. We follow the Law, not because of some external pressure, but rather from a living, vibrant center within us where the Spirit of the Living Lord is working to transform us into the real us we were ultimately created to be. God reached out and saves us because He loves us. As His children He desires that we join Him in His work. Letting our light shine by following the leading of His Holy Spirit is one of the ways God is proclaimed to a hurting, dying world. The world doesn’t need more laws. It simply needs more of Jesus. Join me today in seeking to let Him live larger, more completely through us today. I love you friend. Be blessed today and be that blessing God intends in someone’s life today.